A whole bunch of Windows Holographic VR headsets have gone live at CES this week with first Lenovo then HP, Dell and Acer showing off new, affordable PC VR headgear. The prices range from $300 at the lowest to around $400 - the Lenovo - and they are all due to launch this year (second half), even though the announcements are short on official names. They will join Microsoft's already announced Windows 10 VR headset which has a more Rift-like design but may not get an actual release. All the third party designs shown off at CES so far sport a headband design, a la PlayStation VR, rather than a more secure strap. That could mean it's a lot easier to take on and off like Sony's headset though and a better bet for glasses wearers. Each headset has a pair of depth-sensing cameras on the front which is designed to let us have room-scale tracking without putting sensors around our house. 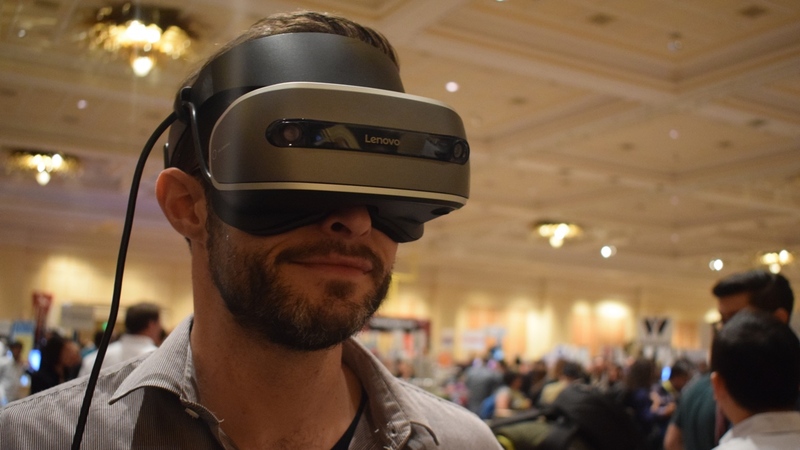 As for what we'll be doing with them, Lenovo has said its headset won't be compatible with existing Oculus or Vive VR apps and games but it may work with some HoloLens apps, i.e. scanning real world items to bring them into virtual worlds. So far, all the Windows Holographic devices at CES 2017 are dummy units or behind glass but you'll be the first to know if/when we get some time inside a working Windows VR headset. We weren't sure whether we would see these devices show up at CES and even though there's still a lot we don't know, it's clear that PC makers are taking Microsoft's platform seriously. Give it six months and we'll have a lot more choices when it comes to VR headsets under $500.